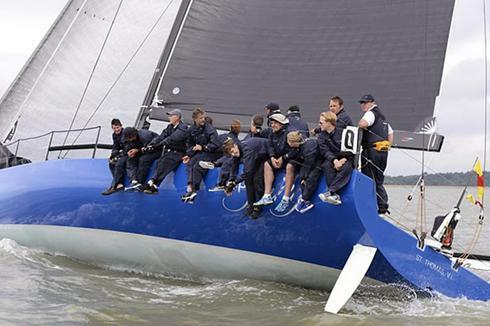 Merf Owen's had nine days out of the office crewing on the RP-52 Cape Fling, winner of Class 0 at Cowes week. "Every day has been an awesome learning experience as a sailor and a designer. You can't just sail your own rides if you want to keep learning. No one has a monopoly on good ideas and drawing IRC/rating boats is one of the design goals we set ourselves some time back." At the same time as racing Merf was logging performance data and feeding back to the trimmers/afterguard prior to the next days sailing. OCD have been using KND performance software for over a year now and are able to refine a yachts polars with real data, build reference tables for a boat's optimal configurations and trim settings. As well as ‘real time’ regatta feedback we’re able to upload all the results to a database in order to analyse an entire season. Attached a Video of the yacht at high speed on the south side of the Isle of Wight at Cowes Week 2014.